When the future of redevelopment agencies started to look shaky last year, West Sacramento decided it could do without one. The city put together a new financing strategy, and in May the Community Investment Action Plan was revealed. The 36-page document doesn’t pretend to hold all the answers to building without redevelopment funds, but it examines new programs the city might consider to pay for infrastructure, recreation and affordable housing. Aaron Laurel, West Sacramento’s revenue and grants manager, says the new opportunities won’t provide all that redevelopment agencies once could, since those organizations were able to bridge hefty funding gaps with tax-increment funding. But with some creativity, construction progress still can be made. Since 2006, West Sacramento has planned for or built 664 affordable housing units. The average financing gap has been $54,800 per unit. “That’s what we use as our planning tool moving ahead,” Laurel says. A key element in West Sacramento’s plan is inclusionary zoning, which requires 20 percent of any housing development to be classified as affordable. Developers can pay a fee to the city instead of building the affordable housing. The Community Investment Action plan suggests making that a higher priority, giving developers other options for meeting the target. The in-lieu fee could be scaled to encourage dense development in targeted infill areas, for instance. The city might consider equity sharing, setting up a trust fund that would get a share of any increase in value when the affordable housing is sold. West Sacramento owns about 300 acres, much of it in places with development potential. Most had been owned by the redevelopment agency, and state law says it has to be disposed of. The action plan suggests using the revenue for community investment. West Capitol Avenue is looking pretty snazzy these days. Modern buildings with shiny, chrome lettering line clean, wide sidewalks. 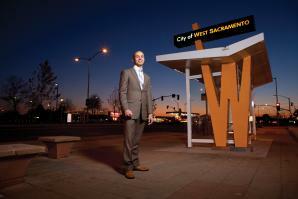 Newly planted trees lead to bright bus stops stylized with sculptured ‘W’s nearly 10 feet tall. 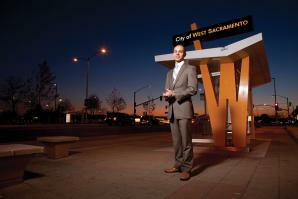 There is nobody more bullish on the City of West Sacramento than Mayor Chris Cabaldon. He says no city in the region can boast of a better location and, perhaps most importantly, a better water supply. With these two key attributes, the mayor believes the west-bank city is well positioned to attract business, jobs and residents for the foreseeable future.